Whispering Pines Dental employs the latest technology in caring for you and your family’s oral health. A visit to our Lorain offices today is one filled with expert care from Dr. Julie Pruneski, along with our dedicated staff, plus the tools and technologies to make your visit as pleasant and pain-free as possible. Cerec is a system comprised of two state of the art components. The first is a computer assisted CAD/CAM 3 imaging impression. This digital impression is wirelessly sent to the second component, an onsite porcelain milling unit. 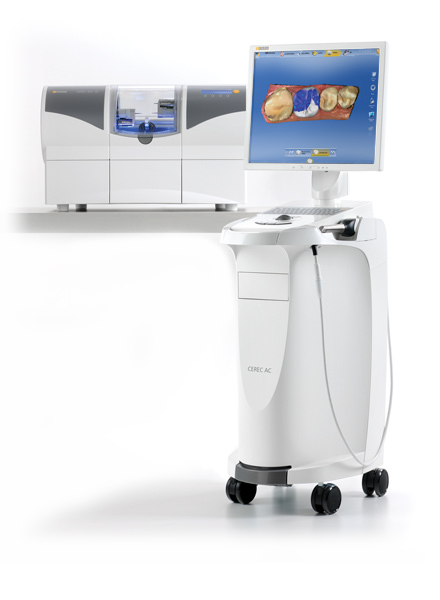 At Whispering Pines Dental, we have the Cerec Omnicam Acquisition unit and the Cerec MC XL milling unit. Together this technology is the most cutting edge same-day crown system, providing you quick results with the highest quality possible. Using this state of the art technology, at Whispering Pines Dental we are able to provide these same day dental restorations. Previously, a crown required a visit to capture a physical impression. This was then sent to a dental laboratory. Once the crown was completed, the patient had to come back into the office and have it seated. With Cerec, we eliminate the need for two appointments. 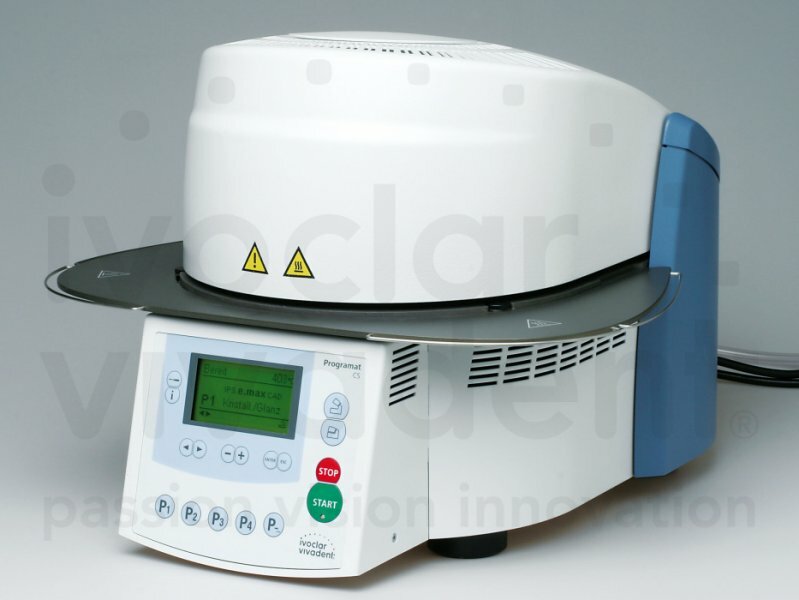 In our Cerec milling unit, we utilize e.Max blocks (a leucite reinforced ceramic material). After the crown is milled, we coat it using a glazing compound and it is placed into the glazing furnace. This causes the particles inside the glaze and the e.Max crown to crystalize, creating crowns that are twice as strong as typical CERECs. We find this step in the crown process to be invaluable, providing you an extremely strong restoration that will stand the test of time. Digital radiography is a form of x-ray imaging where digital sensors are used instead of traditional film. One of the biggest advantages of digital x-rays is that it reduces our patient’s exposure to radiation—usually 70 to 80 percent. In addition, there is no chemical processing of the x-rays, eliminating the environmental impact associated with disposal of conventional film developers. Finally, digital x-rays are immediately available, eliminating the need to wait for them to be developed. 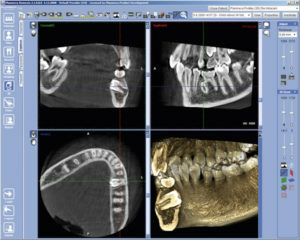 The bitewing and periapical x-rays are traditionally taken utilizing our digital intra-oral x-ray sensor. However, for kids, patients with small mouths, or patients with a stronger gag reflex, our 3D Cone Beam Panoramic X-Ray allows us to take those extremely important diagnostic x-rays without the oral discomfort of the sensor. 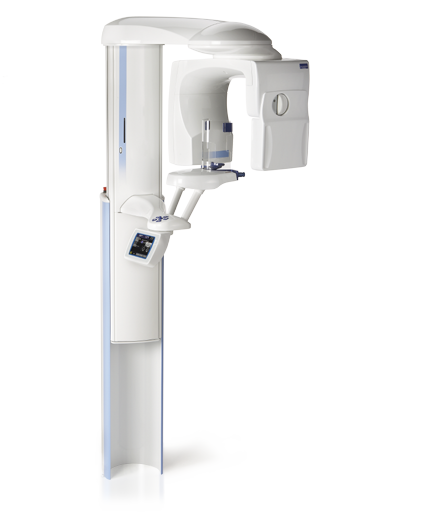 The panoramic x-ray utilizing out digital cone beam system is of the highest quality and exposes the patient to a much smaller dose of radiation than tradition film based panoramic x-rays. 3D Cone Beam CT scans provide a 3-dimensional image that allows us to diagnose the exact position of impacted wisdom teeth, determine the precise location to place dental implants, and accurately determine the number and location of canals for root canal therapy. 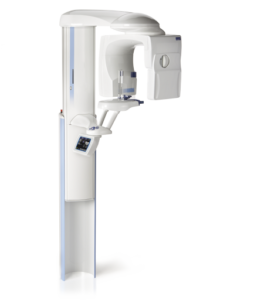 3D Cone Beam imaging is truly the cutting edge in the dental health field, at Whispering Pines Dental we are proud to be able to provide this revolutionary technology to our patients. The soft tissue laser emits concentrated energy in the form of a light beam. This beam is used remove tissue in an extremely precise manner. The soft tissue dental laser is unique because it can be used as a surgical instrument without some of the unwanted surgical effects. The laser stops bleeding, and seals lymphatic and nerve endings, which stops inflammation from occurring and the usual discomfort that is associated with inflammation. This allows patients to heal more quickly with much less discomfort. With the intraoral camera, we are able to take pictures of your teeth and show them to you as we see them. This helps us to explain what is going on with your teeth as well as to have a record of any issues going on in your mouth. The cavity causing pain when you eat sweets, the tartar and plaque growing on your teeth, swollen gums, and broken teeth and fillings can all be seen by you using the intra-oral camera. This miniature camera is designed into a device that looks like a slightly oversized pen and allows us to guide you on a tour of your mouth. You are able to look at the TV monitor in our operatories and see for the first time what we see as dentists. An intraoral camera is an indispensable diagnostic and educational tool. The tiny video camera moves around inside your mouth and generates a tooth-by-tooth video exam of your teeth. The images can be stored, and later enlarged and printed. Once treatment options are discussed and agreed upon, intraoral cameras can be used to effectively track treatment progress. 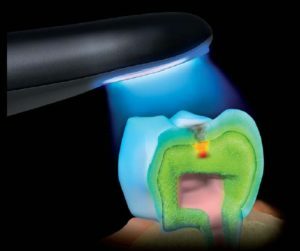 The laser cavity scanner is the newest tool used to detect density changes within your teeth at the earliest stage. This allows us to find cavities much sooner than what can be diagnosed with x-rays alone. Have you ever had a dentist find a cavity and place a large filling, and wondered why the filling is so large if the cavity wasn’t there just six months before? The cavity was there six months before – it just wasn’t big enough to show on X-rays, and it wasn’t visible to us yet. The laser scanner can find the decay years earlier, when the small cavity can be removed and repaired with a small invisible bonded filling. The laser cavity scanner can detect previously undetectable decay and, once identified, allow us to remove decay and leave you with a healthy smile. Electric handpieces are electrically-powered tools used by dentists in a wide variety of procedures. Electric handpieces have a variety of different head attachments known as burs that can be used in different procedures. Such handpieces are a significant improvement over their predecessors, drills powered by air. Electric handpieces are more powerful and precise than air-powered drills, causing less vibration, allowing the dentist to work more quickly, and minimizing any unpleasant drilling sounds. These handpieces provide the patient with a significantly more comfortable experience than air-powered drills. Because electric handpieces offer dentists increased power and precision, procedures can be significantly shorter. And the reduced noise generated by electric handpieces helps patients relax during their procedure. As an added benefit, electric handpieces can be set to various RPM levels for different procedures. This isn’t the case with air-powered drills. There are only two settings on an air-powered drill – on and off. That means more pressure than necessary in many circumstances and far less precision. The electric handpieces we use at Whispering Pines Dental also have tiny LED lights inside of them. This makes it much easier to see in the dark recesses of the mouth. The speed, precision, quietness, and illumination of our electric handpieces make them invaluable in providing you the best treatment experience. At Whispering Pines Dental, we are committed to providing you the finest dental care utilizing the best technology and methods available. Call us today at (440) 282-2023 to reserve an appointment at Whispering Pines Dental.